When you’re moving virtual machines around, you’ll frequently use a tool such as vMotion. But what happens when you’re trying to load new virtual machines into VMware from the .vmdks on a client system or trying to archive a virtual machine that isn’t actually destined for another host? You can use nfs or ssh to access an ESX host, but there’s an even simpler way: the Datastore Browser. To use the Datastore Browser, first login to the vSphere Client. If you’ll be archiving a virtual machine, from there, I would stop the virtual machine. Then click on the virtual machine in the sidebar and click on Summary to see the Resources available to the VM. 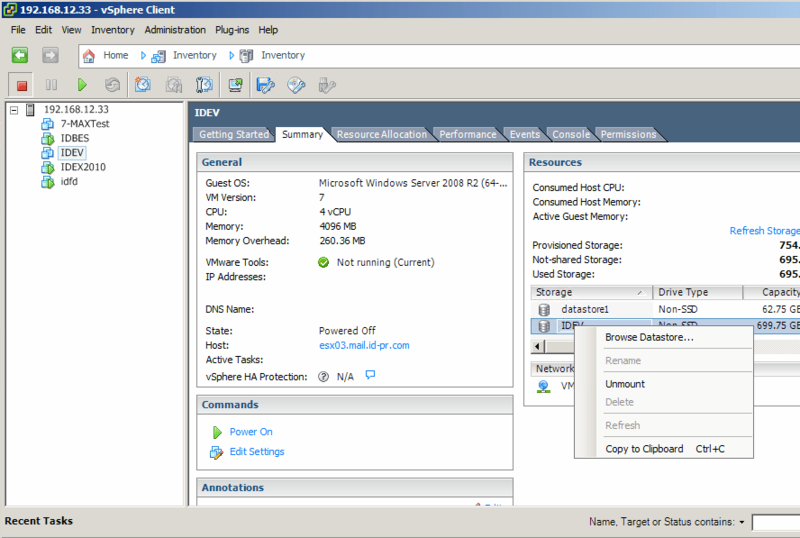 In storage, right-click on the datastore that houses the virtual machine and click on Datastore Browser. The Datastore Browser opens. From here, you can browse assets, including the vmdk files, vmx files and logs. Click on one (or shift-click on many) and then click on the download button in the toolbar (alternatively click none and click on the upload button if you’d like to upload something). The download option brings up a browser so you can choose where to drop your assets off. Once done, you can deprovision storage or simply delete assets as needed.